Exercise, especially eccentric exercise, increases tensile forces placed on the cell membrane as myosin and actin pull to initiate or maintain contraction.10,11,12 While muscles typically regenerate and hypertrophy in response to exercise-induced stress, the muscle cells of people with DMD degrade and are not able to regenerate appropriately.5,6,7 For this reason, exercise may actually accelerate disease progression. Alternatively, certain forms of low to moderate intensity exercise may induce a transformation of certain muscle fibers from a fast-twitch glycolytic profile toward a slower, oxidative preference.13 Slow twitch fiber composition may be beneficial to the person with DMD in the later stages of disease. Minimal research has explored the cellular response of dystrophic muscle fibers in humans in response to exercise. Typically, animal models are used to explore effects of training prior to exploration in human subjects. 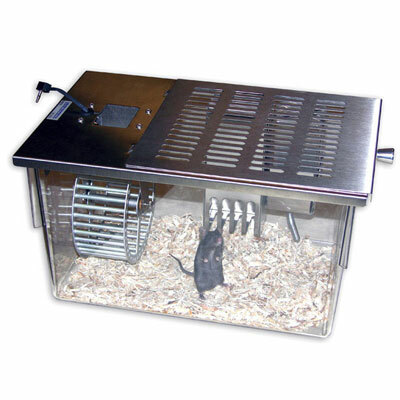 The most common animal model in use for DMD is the mdx mouse model. Mdx mice display a lesser phenotype than humans despite a similar genetic mutation14, thus exercise studies on mdx mice do not accurately represent the severity of changes seen in humans with exercise. With this in mind, results of exercise responses in animal studies must be carefully assessed prior to initiating a training program in the human model. Currently no exercise protocol exists for children affected by the genetic mutation causing DMD. Muscle morphology during varying ages of mdx mice have been studied, finding 17% of overall muscle fibers branched in 1-2 month old mdx mice, while 6-7 month old mdx mice exhibited 89% of fibers branched. In addition to greater numbers of branched fibers, branching patterns seen in older mdx mice were more complex than those found in younger mdx mice.18 Muscles from both mdx age groups were also subjected to an in situ eccentric protocol consisting of 15% strain on the Extensor Digitorum Longus muscle (EDL) via pinning to a force transducer and 3 trials of stimulation using an electrical current with 5 minute rest intervals. Force production was measured before and following completion of the procedure. Younger mdx mice displayed a 7% force deficit following eccentric contractions, while older mdx mice exhibited a 58% force deficit, which was significantly higher than young mdx mice and control mice force levels.18 Research by Head19 displayed a 40+8% drop in maximal force production following a moderate in situ eccentric protocol, using mounting to a force transducer and stimulation via electrical stimulation, in older mdx muscles with >90% branched fibers compared to no observed force loss in either control muscles or mdx muscles with <10% branched fibers. This data shows a correlation between age of muscle fibers and extent of muscular branching and amount of contraction-induced damage leading to overall loss in force production capacity in the mdx mouse model.19 While these results are convincing, one should maintain caution in generalizing them to the human phenotype of DMD. As stated before, the mdx mouse expresses a milder form of DMD than humans, and the nature of in situ muscle dissection experiments do not lend themselves to realistic comparison to the types of contractions experienced by boys with DMD. In the above studies, 3 trials of stimulation, at most, were performed. Lengthening contractions during exercise or general activity by boys with DMD will typically consist of more than 3 consecutive episodes of muscle fiber lengthening. When combining this fact with the reported force loss in mdx mice and their known milder phenotype, one could assume that eccentric contractions have the potential to be even more damaging in humans. Burdi et al.26 have discovered that cAMP and the phosphodiesterase inhibitor pentoxifylline help decrease the increased calcium influx.26 This discovery has helped scientists focus their research on these mechanisms to help stop the overwhelming influx of calcium into the cells.26 Kaczor et al.3 have found that low intensity aerobic exercise can actually help improve calcium homeostasis.3 This is discussed more in depth below. Figure 2. Representative light micrographs of left ventricles from mdx mice after aortic band operation to simulate increased pressure similar to exercise induced increase in systolic pressure. Figures show the sham operated mdx mice (A), aortic banded mdx mice on day 2 (D) and on day 14 (G), and aortic banded control mice on day 14 (J). B and C, E and F, H and I, and K and L are light micrographs of the areas surrounded by arrows in A, D, G, and J, respectively, at higher magnification. Arrowheads show lesions. Scale bar in J represents 0.4 mm and in K and L 20 μm. HE, hematoxylin–eosin stain; Azan, Azan stain. As mentioned in the cellular biology section, with advances in pulmonary interventions for patients with DMD, there is an increase in the incidence of deaths from cardiomyopathy.27,31,32 Additionally, advances in technology to repair skeletal muscle in DMD could have devastating consequences on the hearts of patients with DMD. Repairing skeletal muscle and improving the ability of the muscle to withstand exercise leads to higher participation of individuals with DMD in physical activity and an increased vulnerability of cardiac muscle to sustain damage from contractions.31,33 A mouse model, termed Tg-mdx, has been used to determine the effects of a modified dystrophin molecule or mini-dystrophin to repair skeletal muscles, including the diaphragm, and the resulting implications for the heart.31,33 Results showed reduced ejection fraction, a significant increase in left ventricular diastolic volume, and cellular necrosis indicated by a significant, fivefold increase of intracellular accumulation of immunoglobulin in the heart.31,33 This indicates that future therapies need to be mindful of the cardiac involvement in patients with DMD when addressing the skeletal muscle deficits. Although not all of the expected adaptations occurred in mdx mice in response to 8 weeks of voluntary wheel running, some adaptations did occur, and can provide information for future research on the prescription of endurance exercise for patients with DMD. High intensity exercise requiring increased levels of exertion from patients with DMD has widely been discouraged as a main mode of exercise due to potentially damaging muscular results via eccentric contractions. In DMD, when the prime movers of a joint weaken, a higher percentage of an individual’s maximal strength level is required to perform relatively low intensity tasks. This ultimately leads to shorter time to fatigue and hypertrophy of remaining functional muscle fibers, which places them at a higher risk for subsequent contraction-mediated damage during future intense actions.11,63 Therefore, exercise which qualifies as high exertion can potentially have serious deleterious effects on the remaining functional muscle cells in DMD patients. In a study by Okano51, the levels of IGF-1 were decreased following chronic high intensity exercise in mdx mice. IGF-1 has been closely linked to regeneration of muscle following exercise and is responsible for inducing the expression of myogenic factors as well as promoting the proliferation and differentiation of satellite cells.51 Similarly, in mdx mice performing inclined treadmill running (15 meters per minute, 60 minutes per week, 5 weeks), there were significant increases noted in p38 MAPK, p-ERK ½, and JNK2 in the gastrocnemius muscle.64 These results display a correlation between higher exercise exertion levels, increased muscle damage through oxidative stresses, and limited muscle fiber healing and regeneration leading to apoptosis in the mdx model. However, research involving mdx mice and intense exercise has produced mixed results. Mdx mice displayed increased resistance to fatigue in the EDL and Soleus (SOL) muscles compared to control mice following a 15-week endurance protocol consisting of swimming 2 hours per day for 5 weeks. The exercised mdx mice also exhibited a greater number of Type I (slow oxidiative) muscle fibers in both muscles compared to sedentary mdx mice where SOL was primarily Type I and EDL primarily Type II.63 This change illustrates a potential benefit of muscle fibers converting to Type I fibers specifically as a means to adapt to intense exercise and attenuate fiber damage. Supporting these findings, large, Type II muscle fibers have been shown to be preferentially damaged by high force-producing lengthening contractions often seen in intense exercises.12,13 Normally, an increase in Type I muscle fibers is associated with participation in endurance-based, low intensity exercise, underlining the need for safe, effective human trials in DMD. A study is currently underway involving exercise training for boys with DMD.65 Research in the mdx mouse suggests that low intensity, non weight-bearing exercises have no detrimental effects; low-stress exercises may actually have beneficial effects on energy efficiency and myofiber contractility through a decrease in oxidative stress and a shift from fast twitch muscle fibers to slow twitch fibers.65 However, there have been no studies demonstrating this effect in the human model. This is the first study designed to examine these effects in humans with DMD. Study 165 involves dynamic leg and arm training in ambulatory or recently wheelchair-bound boys. This portion of the study utilizes bicycle training of both upper and lower extremities with or without electrical motor support. Subjects will exercise at a low to moderate intensity and continuous speed 5 days a week for 24 weeks. Each session will be 30 minutes long with 15 minutes dedicated to upper extremity cycling and 15 minutes dedicated to lower extremity cycling. Termination of the session or an increase in motor support to decrease intensity will occur if the subject is unable to maintain a 60rpm pace during a Six-Minute Bicycle ergometer Test. The control group for this portion of the study will receive usual care. Study 265 is an observational study involving functional training with arm support for boys who have been in a wheelchair for a few years. The six month training program includes functional training of the non-dominant arm and hand with mechanical arm support and computer-assisted training. If a boy cannot touch his nose with mechanical arm support, electrical arm support will be supplied. The boys will play 5 rounds of a computer program called Furrballhunt that involves variable reaching motions 5 days a week. The results of this new exercise study will be available in the near future. Therefore, clinical judgment should be used before prescribing exercise to all patients with DMD. Determining an appropriate frequency and duration is currently a main focus of research in the mdx mouse, but exercise parameters have not been determined in the mdx mouse at this time. In dystrophin-deficient muscles, inadequate amounts of satellite cells can lead to impaired muscle regeneration following microtrauma caused by eccentric contraction during exercise. This microtrauma causes calcium to flood the muscle cells leading to further cell damage and necrosis. As more and more muscles become damaged, muscle force production decreases and higher percentages of an individual’s maximal force production are required to perform relatively low intensity tasks. In response, remaining functional fibers hypertrophy and are at an increased risk for further contraction-mediated damage. Decreased IGF-1 levels are seen following high intensity exercise in mdx mice indicating decreased potential for muscle regeneration. Exercise-induced mechanical stress can accelerate the dystrophic process in many different muscles including respiratory muscles and the myocardium. Damage to the myocardium is a serious concern with the increase in physical activity in patients with DMD. Although the evidence indicates that high intensity exercise is detrimental to individuals with DMD, current research shows promising trends with lower intensity exercise programs. Low intensity aerobic and resistance exercise has been found to be beneficial in mdx mice. ROS production and levels of oxidative stress markers are increased initially, but adaptation occurs as the exercise progresses resulting in a reduction of ROS production and oxidative stress. Other research has found that voluntary non-resistance wheel running can show beneficial effects in DMD skeletal muscle. There is evidence to suggest that respiratory muscles can be trained early in the disease progression to increase endurance and strength with an increase in dystrophin similar protein. Further research needs to be done to determine whether the same effects are seen in the human model and what exercise parameters should be used to achieve the cellular adaptations seen in mdx mice. Researchers have been trying to find ways to maximize the gains patients with DMD can get from low intensity exercise programs. Steroids have been used in patients with DMD to decrease inflammatory pathways and prevent the degeneration-regeneration cycle in muscle cells. Pharmacological agents such as IGF-I, antioxidants and inhibitors of TNF-alpha are being studied in mdx mice and have shown promise for decreasing negative effects of exercise. Both the blockade of TNF-alpha and IGF-I administration have been shown to decrease muscle fiber damage and CoQ-10 supplementation was shown to have cardioprotective effects in exercise in the mdx mice. Despite these promising pharmacological findings, further research needs to be done to find a way to completely reverse the damaging effects exercise has on an individual with DMD. 1. Call JA, McKeehen JN, Novotny SA, Lowe DA. Progressive resistance voluntary wheel running in the mdx mouse. Muscle & Nerve. 2010;42(6):871-880. 2. Hayes A, Williams DA. Beneficial effects of voluntary wheel running on the properties of dystrophic mouse muscle. Journal Of Applied Physiology (Bethesda, Md. : 1985). 1996;80(2):670-679. 3. Kaczor JJ, Hall JE, Payne E, Tarnopolsky MA. Low intensity training decreases markers of oxidative stress in skeletal muscle of mdx mice. Free Radical Biology & Medicine. 2007;43(1):145-154. 4. Landisch RM, Kosir AM, Nelson SA, Baltgalvis KA, Lowe DA. Adaptive and nonadaptive responses to voluntary wheel running by mdx mice. Muscle & Nerve. 2008;38(4):1290-1303. 5. Sander M, Chavoshan B, Harris SA, et al. Functional muscle ischemia in neuronal nitric oxide synthase-deficient skeletal muscle of children with Duchenne muscular dystrophy. Proceedings Of The National Academy Of Sciences Of The United States Of America. 2000;97(25):13818-13823. 6. Ozawa E, Hagiwara Y, Yoshida M. Creatine kinase, cell membrane and Duchenne muscular dystrophy. Molecular And Cellular Biochemistry. 1999;190(1-2):143-151. 7. Sussman M. Duchenne muscular dystrophy. The Journal Of The American Academy Of Orthopaedic Surgeons. 2002;10(2):138-151. 8. McArdle A, Edwards RH, Jackson MJ. Time course of changes in plasma membrane permeability in the dystrophin-deficient mdx mouse. Muscle & Nerve. 1994;17(12):1378-1384. 9. Head SI, Williams DA, Stephenson DG. Abnormalities in structure and function of limb skeletal muscle fibres of dystrophic mdx mice. Proceedings. Biological Sciences / The Royal Society. 1992;248(1322):163-169. 10. Weller B, Karpati G, Carpenter S. Dystrophin-deficient mdx muscle fibers are preferentially vulnerable to necrosis induced by experimental lengthening contractions. Journal of the neurological sciences. 1990;100(1-2):9-13. 11. Gehrig SM, Koopman R, Naim T, Tjoakarfa C, Lynch GS. Making fast-twitch dystrophic muscles bigger protects them from contraction injury and attenuates the dystrophic pathology. The American Journal Of Pathology. 2010;176(1):29-33. 12. Childers MK, Okamura CS, Bogan DJ, et al. Eccentric contraction injury in dystrophic canine muscle. Archives of Physical Medicine and Rehabilitation. 2002;83(11):1572-1578. 13. Petrof BJ, Shrager JB, Stedman HH, Kelly AM, Sweeney HL. Dystrophin protects the sarcolemma from stresses developed during muscle contraction. Proceedings Of The National Academy Of Sciences Of The United States Of America. 1993;90(8):3710-3714. 14. Wang Z, Chamberlain JS, Tapscott SJ, Storb R. Gene therapy in large animal models of muscular dystrophy. ILAR Journal / National Research Council, Institute Of Laboratory Animal Resources. 2009;50(2):187-198. 15. Ambrosio F, Kadi F, Lexell J, Fitzgerald GK, Boninger ML, Huard J. 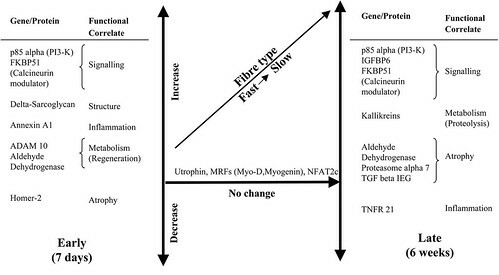 The effect of muscle loading on skeletal muscle regenerative potential: an update of current research findings relating to aging and neuromuscular pathology. American Journal Of Physical Medicine & Rehabilitation / Association Of Academic Physiatrists. 2009;88(2):145-155. 16. Brooks SV. Rapid recovery following contraction-induced injury to in situ skeletal muscles in mdx mice. Journal Of Muscle Research And Cell Motility. 1998;19(2):179-187. 17. Head SI, Stephenson DG, Williams DA. Properties of enzymatically isolated skeletal fibres from mice with muscular dystrophy. The Journal Of Physiology. 1990;422:351-367. 18. Chan S, Head SI, Morley JW. Branched fibers in dystrophic mdx muscle are associated with a loss of force following lengthening contractions. American Journal Of Physiology. Cell Physiology. 2007;293(3):C985-C992. 19. Head SI. Branched fibres in old dystrophic mdx muscle are associated with mechanical weakening of the sarcolemma, abnormal Ca2+ transients and a breakdown of Ca2+ homeostasis during fatigue. Experimental Physiology. 2010;95(5):641-656. 20. Zanou N, Iwata Y, Schakman O, Lebacq J, Wakabayashi S, Gailly P. Essential role of TRPV2 ion channel in the sensitivity of dystrophic muscle to eccentric contractions. FEBS Letters. 2009;583(22):3600-3604. 21. Lovering RM, Michaelson L, Ward CW. Malformed mdx myofibers have normal cytoskeletal architecture yet altered EC coupling and stress-induced Ca2+ signaling. American Journal Of Physiology. Cell Physiology. 2009;297(3):C571-C580. 22. Ratel S, Duché P, Williams CA. Muscle fatigue during high-intensity exercise in children. Sports Medicine (Auckland, N.Z.). 2006;36(12):1031-1065. 23. Johnson BD, Scheuer T, Catterall WA. Convergent regulation of skeletal muscle Ca2+ channels by dystrophin, the actin cytoskeleton, and cAMP-dependent protein kinase. Proceedings Of The National Academy Of Sciences Of The United States Of America. 2005;102(11):4191-4196. 24. Gaines RF, Pueschel SM, Sassaman EA, Driscoll JL. Effect of exercise on serum creatine kinase in carriers of Duchenne muscular dystrophy. Journal Of Medical Genetics. 1982;19(1):4-7. 25. Allen DG, Lamb GD, Westerblad H. Impaired calcium release during fatigue. Journal Of Applied Physiology (Bethesda, Md. : 1985). 2008;104(1):296-305. 26. Burdi R, Rolland J-F, Fraysse B, et al. Multiple pathological events in exercised dystrophic mdx mice are targeted by pentoxifylline: outcome of a large array of in vivo and ex vivo tests. Journal Of Applied Physiology (Bethesda, Md. : 1985). 2009;106(4):1311-1324. 27. Costas JM, Nye DJ, Henley JB, Plochocki JH. Voluntary exercise induces structural remodeling in the hearts of dystrophin-deficient mice. Muscle & Nerve. 2010;42(6):881-885. 28. Kamogawa Y, Biro S, Maeda M, et al. Dystrophin-deficient myocardium is vulnerable to pressure overload in vivo. Cardiovascular Research. 2001;50(3):509-515. 29. Taniguti APT, Pertille A, Matsumura CY, Santo Neto H, Marques MJ. Prevention of muscle fibrosis and myonecrosis in mdx mice by suramin, a TGF-β1 blocker. Muscle & Nerve. 2011;43(1):82-87. 30. Nakamura A, Yoshida K, Takeda Si, Dohi N, Ikeda S-i. Progression of dystrophic features and activation of mitogen-activated protein kinases and calcineurin by physical exercise, in hearts of mdx mice. FEBS Letters. 2002;520(1-3):18-24. 31. Townsend D, Yasuda S, Chamberlain J, Metzger JM. Cardiac consequences to skeletal muscle-centric therapeutics for Duchenne muscular dystrophy. Trends In Cardiovascular Medicine. 2009;19(2):50-55. 32. Xu Y, Delfín DA, Rafael-Fortney JA, Janssen PML. Lengthening-contractions in isolated myocardium impact force development and worsen cardiac contractile function in the mdx mouse model of muscular dystrophy. Journal Of Applied Physiology (Bethesda, Md. : 1985). 2011;110(2):512-519. 33. Townsend D, Yasuda S, Li S, Chamberlain JS, Metzger JM. Emergent dilated cardiomyopathy caused by targeted repair of dystrophic skeletal muscle. Molecular Therapy: The Journal Of The American Society Of Gene Therapy. 2008;16(5):832-835. 34. Wanke T, Toifl K, Merkle M, Formanek D, Lahrmann H, Zwick H. Inspiratory muscle training in patients with Duchenne muscular dystrophy. Chest. 1994;105(2):475-482. 35. Ishizaki M, Suga T, Kimura E, et al. Mdx respiratory impairment following fibrosis of the diaphragm. Neuromuscular Disorders: NMD. 2008;18(4):342-348. 36. Finsterer J. Cardiopulmonary support in duchenne muscular dystrophy. Lung. 2006;184(4):205-215. 37. Laws N, Hoey A. Progression of kyphosis in mdx mice. Journal Of Applied Physiology (Bethesda, Md. : 1985). 2004;97(5):1970-1977. 38. Huang P, Cheng G, Lu H, Aronica M, Ransohoff RM, Zhou L. Impaired respiratory function in mdx and mdx/utrn(+/-) mice. Muscle & Nerve. 2011;43(2):263-267. 39. Dupont-Versteegden EE, McCarter RJ, Katz MS. Voluntary exercise decreases progression of muscular dystrophy in diaphragm of mdx mice. Journal Of Applied Physiology (Bethesda, Md. : 1985). 1994;77(4):1736-1741. 40. Topin N, Matecki S, Le Bris S, et al. Dose-dependent effect of individualized respiratory muscle training in children with Duchenne muscular dystrophy. Neuromuscular Disorders: NMD. 2002;12(6):576-583. 41. Matecki S, Rivier F, Hugon G, et al. The effect of respiratory muscle training with CO2 breathing on cellular adaptation of mdx mouse diaphragm. Neuromuscular Disorders: NMD. 2005;15(6):427-436. 42. Gosselin LE, McCormick KM. Targeting the immune system to improve ventilatory function in muscular dystrophy. Medicine and Science in Sports and Exercise. 2004;36(1):44-51. 43. Archer JD, Vargas CC, Anderson JE. Persistent and improved functional gain in mdx dystrophic mice after treatment with L-arginine and deflazacort. The FASEB Journal: Official Publication Of The Federation Of American Societies For Experimental Biology. 2006;20(6):738-740. 44. Fisher I, Abraham D, Bouri K, Hoffman EP, Muntoni F, Morgan J. Prednisolone-induced changes in dystrophic skeletal muscle. The FASEB Journal: Official Publication Of The Federation Of American Societies For Experimental Biology. 2005;19(7):834-836. 45. Baltgalvis KA, Call JA, Nikas JB, Lowe DA. Effects of prednisolone on skeletal muscle contractility in mdx mice. Muscle & Nerve. 2009;40(3):443-454. 46. Lim J-H, Kim D-Y, Bang MS. Effects of exercise and steroid on skeletal muscle apoptosis in the mdx mouse. Muscle & Nerve. 2004;30(4):456-462. 47. Gehrig SM, Ryall JG, Schertzer JD, Lynch GS. Insulin-like growth factor-I analogue protects muscles of dystrophic mdx mice from contraction-mediated damage. Experimental Physiology. 2008;93(11):1190-1198. 48. Ridgley JA, Pinniger GJ, Hamer PW, Grounds MD. The physiological effects of IGF-1 (class 1:Ea transgene) over-expression on exercise-induced damage and adaptation in dystrophic muscles of mdx mice. Pflügers Archiv: European Journal Of Physiology. 2009;457(5):1121-1132. 49. Schertzer JD, van der Poel C, Shavlakadze T, Grounds MD, Lynch GS. Muscle-specific overexpression of IGF-I improves E-C coupling in skeletal muscle fibers from dystrophic mdx mice. American Journal Of Physiology. Cell Physiology. 2008;294(1):C161-C168. 50. Grounds MD, Radley HG, Gebski BL, Bogoyevitch MA, Shavlakadze T. Implications of cross-talk between tumour necrosis factor and insulin-like growth factor-1 signalling in skeletal muscle. Clinical And Experimental Pharmacology & Physiology. 2008;35(7):846-851. 51. Okano T, Yoshida K, Nakamura A, et al. Chronic exercise accelerates the degeneration-regeneration cycle and downregulates insulin-like growth factor-1 in muscle of mdx mice. Muscle & Nerve. 2005;32(2):191-199. 52. Buyse GM, Van der Mieren G, Erb M, et al. Long-term blinded placebo-controlled study of SNT-MC17/idebenone in the dystrophin deficient mdx mouse: cardiac protection and improved exercise performance. European Heart Journal. 2009;30(1):116-124. 53. Grounds MD, Torrisi J. Anti-TNFalpha (Remicade) therapy protects dystrophic skeletal muscle from necrosis. The FASEB Journal: Official Publication Of The Federation Of American Societies For Experimental Biology. 2004;18(6):676-682. 54. Hodgetts S, Radley H, Davies M, Grounds MD. Reduced necrosis of dystrophic muscle by depletion of host neutrophils, or blocking TNFalpha function with Etanercept in mdx mice. Neuromuscular Disorders: NMD. 2006;16(9-10):591-602. 55. Piers AT, Lavin T, Radley-Crabb HG, Bakker AJ, Grounds MD, Pinniger GJ. Blockade of TNF in vivo using cV1q antibody reduces contractile dysfunction of skeletal muscle in response to eccentric exercise in dystrophic mdx and normal mice. Neuromuscular Disorders: NMD. 2011;21(2):132-141. 56. Radley HG, Davies MJ, Grounds MD. Reduced muscle necrosis and long-term benefits in dystrophic mdx mice after cV1q (blockade of TNF) treatment. Neuromuscular Disorders: NMD. 2008;18(3):227-238. 57. Menazza S, Blaauw B, Tiepolo T, et al. Oxidative stress by monoamine oxidases is causally involved in myofiber damage in muscular dystrophy. Human Molecular Genetics. 2010;19(21):4207-4215. 58. Tidball JG, Wehling-Henricks M. The role of free radicals in the pathophysiology of muscular dystrophy. Journal Of Applied Physiology (Bethesda, Md. : 1985). 2007;102(4):1677-1686. 59. Camiña F, Novo-Rodriguez MI, Rodriguez-Segade S, Castro-Gago M. Purine and carnitine metabolism in muscle of patients with Duchenne muscular dystrophy. Clinica Chimica Acta; International Journal Of Clinical Chemistry. 1995;243(2):151-164. 60. Grange RW, Call JA. Recommendations to define exercise prescription for Duchenne muscular dystrophy. Exercise And Sport Sciences Reviews. 2007;35(1):12-17. 61. Carter GT, Wineinger MA, Walsh SA, Horasek SJ, Abresch RT, Fowler WM, Jr. Effect of voluntary wheel-running exercise on muscles of the mdx mouse. Neuromuscular Disorders: NMD. 1995;5(4):323-332. 62. Wineinger MA, Abresch RT, Walsh SA, Carter GT. Effects of aging and voluntary exercise on the function of dystrophic muscle from mdx mice. American Journal Of Physical Medicine & Rehabilitation / Association Of Academic Physiatrists. 1998;77(1):20-27. 63. Palmieri B, Sblendorio V, Ferrari A, Pietrobelli A. Duchenne muscle activity evaluation and muscle function preservation: is it possible a prophylactic strategy? Obesity Reviews: An Official Journal Of The International Association For The Study Of Obesity. 2008;9(2):121-139. 64. Nakamura A, Yoshida K, Ueda H, Takeda Si, Ikeda S-i. Up-regulation of mitogen activated protein kinases in mdx skeletal muscle following chronic treadmill exercise. Biochimica Et Biophysica Acta. 2005;1740(3):326-331. 65. Jansen M, de Groot IJ, van Alfen N, Geurts AC. Physical training in boys with Duchenne Muscular Dystrophy: the protocol of the No Use is Disuse study. BMC Pediatrics. 2010;10:55-55. 66. Willmann R, Possekel S, Dubach-Powell J, Meier T, Ruegg MA. Mammalian animal models for Duchenne muscular dystrophy. Neuromuscular Disorders: NMD. 2009;19(4):241-249. 67. Nye DJ, Costas JM, Henley JB, Kim J-K, Plochocki JH. The chondrogenic response to exercise in the proximal femur of normal and mdx mice. BMC Musculoskeletal Disorders. 2010;11:198-198. I really liked how you summarized your findings. Your page is easy to navigate and has a lot of great information on it. Your explanations are clearly stated throughout the page. Mentioning that phenotypic differences exist between mice with MD and humans with DMD provided a responsible caveat to your information.